Yesterday I had some problems with my stomach. For the first time on my trip. So I ordered just a soup on the night market of Nuang Namtha. I thought “All or nothing!” and so I added tons of chili to the soup. Like the Thais say: “Spicy = healthy!”. And the Thais know what they say. This morning everything was ok and I felt fit enough for my mountain bike trip. But first I went out for a warming breakfast. I found a small restaurant full of locals and had another Thai inspired Curry soup (Khao Soi Gai). After the breakfast I rented a mountainbike for 1,80 € per day and started my long tour around Lunag Namtha. I skipped my plan to go in the jungle. You only can book this tour at one of the agencies here. And getting lost in the jungle isn´t a good think because there are wild tigers living inside the jungle. But I was in the mood of “Do it yourself!” and so I started my day tour by myself. And I was sure it was the right decision. In the fresh morning air I first came to a village called Ban Nam Dee where I met an Australian guy sitting next to an open fire with some local farmers. He used to work here for 2 years as a doctor and he came back to visit some of his friends in this village. So I took a seat next to the men and we had a long conversation. From there I followed a small path next to some dry rice and vegetable fields. Here it is winter at the moment. Or fall. They only have three seasons here. I really enjoyed my ride. I came back to a bigger street in the valley of Luang Namtha. I followed it for a few kilometers. Little villages passed by and I left the street to follow a small path. I crossed a bamboo bridge and made a short break in one of the small villages. Here are no big stores but many people have a small store at their house. The supermarket is in one of the windows of their houses. So I found a place where I could buy some water. I now was south of Luang Namtha and I had a great view all over the valley. After 10 more kilometers on my bike I came back to the small city. 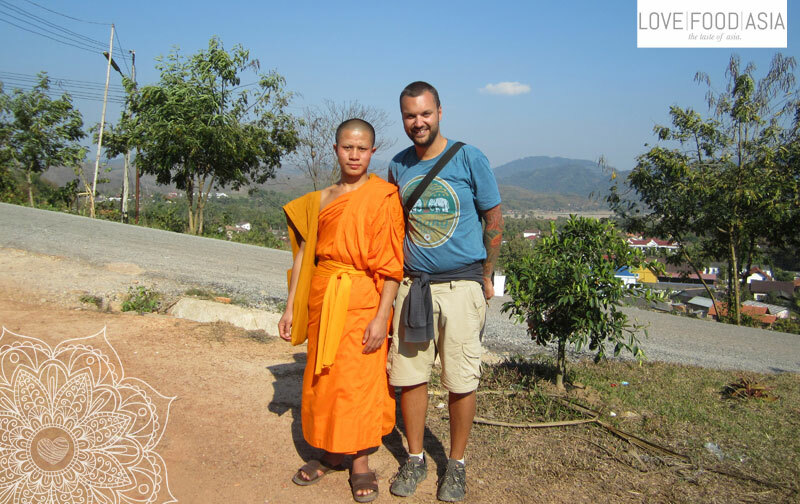 Now it was time for a longer break but I haven´t had enough and so I drove up the mountain in the western part of Luang Namtha to visit the stupa and the monastery. I stooped there and met a young monk on the steps next to the monastery. He showed me around and we had a long conversation. He also helped me to learn some more Laotian words. Another great experience. After our conversation I walked up to the stupa. But after all the stupas and pagodas I´ve seen so far this one was just another one on my long list of visited stupas. But up here I had a great view over Luang Namtha. I drove back to my guesthouse and had a short nap before I walked over to the night market where a had a delicious papaya salad (Som Tam) with grilled pork belly (Moo Krob). Tomorrow I will take the bus to Muang Xai to get closer to the south of Laos.